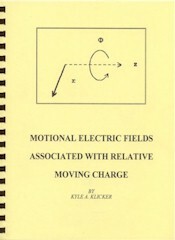 This book evaluates the motional electric field and Dr. Hooper's gravity field research. The author was unable to disprove Hooper's claim that the motional electric field associated with a current induced by flux cutting is immune to shielding. The concept that the magnetic flux, induced by moving charge or an electrical current, moves with the charge carriers that induce it, is explored. This idea was promoted as late as the 1960's by W.J. Hooper and still remains a contested issue. Hooper claimed to have verified this experimentally and also identified some fundamental qualitative differences between types of electric fields distinguished by their origin. An analytical investigation of these claims has been undertaken. This author has not been able to disprove Hooper's claims. It is established that there are three types of electric fields. The first due to a distribution of charge known as an electrostatic field. The other two are associated with the two types of electromagnetic induction. The first type of induction is known as flux cutting and is due to relative spatial motion with respect to magnetic flux. The electric field resulting from this type of induction is the motional electric field. This type of electric field has unique properties that separate it from the other two. Experimentally, it is confirmed that this electric field is immune to shielding due to the fact that magnetic (not electric) boundary conditions apply to it. Motional electric fields can also exist where the total magnetic field that induces it consists of non-zero components that sum to zero. The other type of induction is due to linking time changing magnetic flux. Inclusion of the concept of magnetic flux moving with the current or charge carriers that induce it into classical electro-magnetic theory results in a small additional force between relative moving charge that is not predicted by classical EM theory. This difference is due to a motional electric field that surrounds all moving charge if the idea of moving magnetic flux is subscribed to, This term is dependent on the square of the relative velocity and is equivalent to the term generated by special relativity when applied to relative moving charge. Ampere electrodynamics also predicts the existence of this force. Consequently, three incompatible and fundamentally different models of EM effects yield the same results.